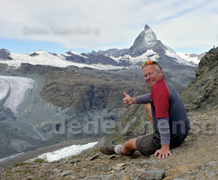 So I decided to take advantage to recover on a hike from Konstanz to the Matterhorn through Switzerland near the Italian border. The Alps are the last natural retreat of Central Europe. After a sponsor meeting at the Friedrichshafen Outdoor Trade Fair I took off. Actually I wanted to go to Genoa, Italy (Mediterranean) but my newly bought tent, an Exped Velo 1 had always ‘freshly running water’ even after one kilo of seam sealer, and since an end of the rain was not foreseeable, I canceled the remaining leg. Despite of some imperative necessities I had go to the world known Aletsch Glacier in where hundreds of hikers used the cable car to the summit in order to get boozed on top ASAP. Others were almost pushed from the summit platform by the crowd, but anyway I was actually alone most of the time it was very relaxing. Especially to sleep out on the glacier, where I did her the growl of its movements at night. The Alps are still worth to go if you stay away from the tourist trekking highways.